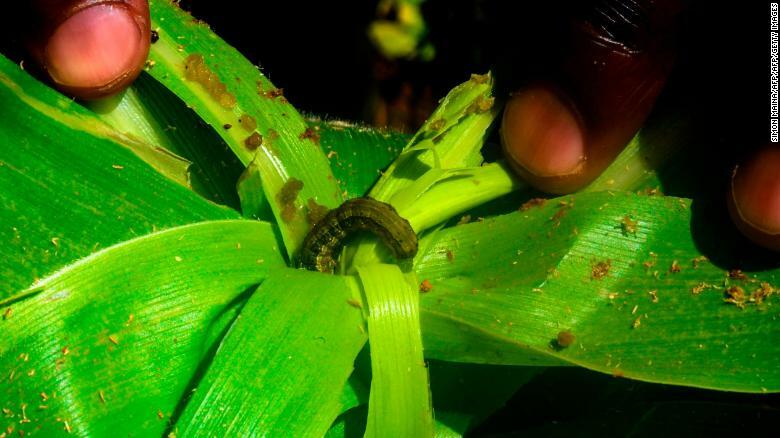 After wreaking havoc in Africa, ‘impossible to kill’ crop-destroying worm reaches Asia – Thrakika Ekkokistiria S.A.
A fall armyworm attacking a maize crop in Vihiga, Kenya. New Delhi (CNN) After leaving a trail of ruined crops in Africa and the Americas, an invasive worm has been found in India, prompting concern that it could have a devastating effect on the country’s agriculture. Fall armyworm, a pest which feeds on maize and other key crops, has been detected in the the state of Karnataka, according to officials. In neighboring Tamil Nadu, about 15% to 20% of the maize crops on the campus of Tamil Nadu Agricultural University showed evidence of the worm. It has already ravaged a dozen or so countries in Africa, with some areas of Zimbabwe suffering up to 70% crop destruction. 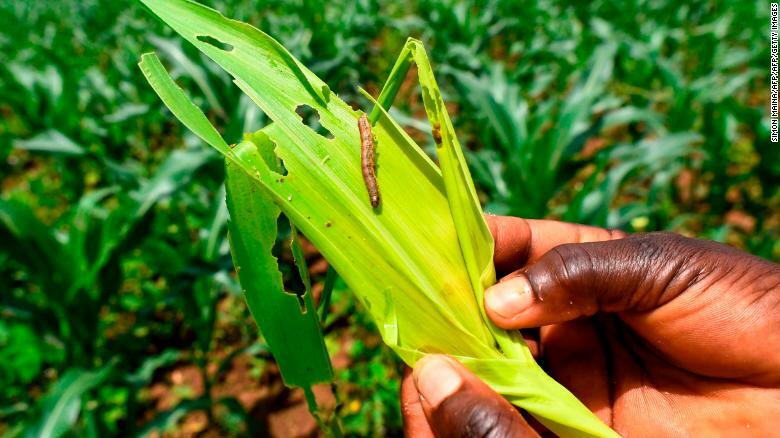 According to the Center for Agriculture and Bioscience International (CABI) and the UK’s Department for International Development, African nations stand to lose between $2.4 billion and $6.1 billion due to the worm. Indian officials and observers are fearing a similar effect on the subcontinent. “This will certainly spread to India’s neighbors to the east,” said Roger Day, program executive of Action on Invasives at CABI. He said that East and Southeast Asia has plenty of “environmentally suitable” areas where the pest can thrive, including Bangladesh, Myanmar, Laos, Thailand, Vietnam, Philippines, Indonesia, and China. And there’s little anyone can do about it. Previous and costly attempts to stop the worm have been largely unsuccessful. With the worm detected in at least two states so far, SK Jalali, a scientist at the Indian Council of Agricultural Research (ICAR), said he and his colleagues are bracing themselves for the worst. “How the worm will spread, we do not know yet,” Jalali said. Labs across India have been alerted and told to conduct surveys of their own, but it may be too late to stop the worm’s expansion. “It looks like that it has already been present for a while. I would not be surprised if it has already spread past Karnataka,” said Day. The Indian infestation is being monitored by multiple international organizations, including CABI and the United Nations’ Food and Agricultural Organization. The goal, Day said, should be control rather than eradication. Scientists and researchers have formulated ways to slow the spread or to fight the infestation using bio-pesticides. Due to the speed at which the pest multiplies, India will have to move fast in evaluating the impact and distributing the necessary pesticides to farmers. But even that won’t be enough to eradicate the worm, according to Day. The inch-long armyworm is native to tropical and subtropical parts of the Americas, and can migrate over vast distances. No large-scale solution to kill the animal, the larval form of the armyworm moth, has yet been found. It prefers to feed on maize but also has an affinity for rice, sugarcane, cotton and vegetable crops. Maize is India’s third most important crop, according to the Ministry of Agriculture and Farmers’ Welfare, which estimates production at 18.73 million tonnes in the past year. In southern Africa, the pest devastated maize crops, with Zambia even deploying its air force to help spray pesticide over affected areas. The pest’s ability to spread across countries and continents has been put down to contaminated produce being transported across borders, and the adult moth’s ability to fly long distances to breed.